CLASS REGISTRATION Pre-registration is required for all classes. Fees are due at the time of registration. CHILDREN IN CLASS We offer cooking classes designed especially for students aged 4-16. Students aged 16-18 need prior approval to attend adult classes. Please call 916-868-6399. We ask that babies and small children are not brought to class. PARKING Complimentary parking is available on the first floor of the parking garage at 28th and S. After 6 pm and on weekends all levels of the garage are available. CANCELLATION POLICY: Fee is nonrefundable and classes are nontransferable with less than a 48-hour cancellation notice. Menus may change due to availability of seasonal ingredients. We expect all students to behave in a safe and respectful manner, and we reserve the right to refuse service to anyone. Welcome! The Co-op’s Cooking School & Community Learning Center offers something for everyone— cooking classes for cooks of all ages, interests and levels of experience; wellness seminars; events at local farms, and workshops to encourage healthy living and creativity. Our brand new classroom is located upstairs in the newly expanded Co-op at 2820 R St. It’s a great place to discover new flavors and skills and enjoy everything the Co-op has to offer. Students receive copies of the recipes in all cooking classes. Snacks and a sample of each menu item will be served. A complimentary glass of wine is offered to students 21 and over in most classes. Students get handson practice making one or more of the dishes listed in the menu. Samples of each dish will be served at the end of class. Demonstration Style Classes These classes are dynamic and interactive; students ask questions, watch the chef demonstrate essential techniques, learn about ingredients and sample each dish. All classes are demonstration style unless otherwise noted. Seasonal Dinners We feature talented local chefs, farmers, winemakers and artisans. A full meal is served, including at least one wine pairing. This series of three classes presents the basic building blocks for a well-rounded home cook’s repertoire. 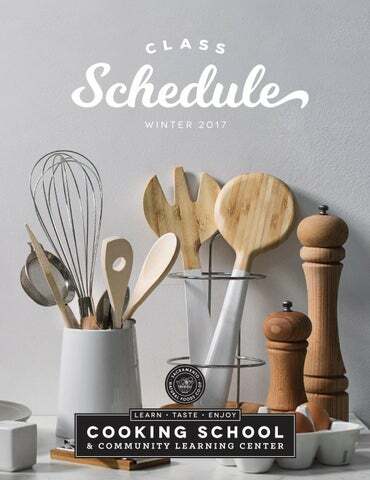 Inspired Kitchen Organization Saturday, February 11 2-3:30 pm • $15, $10* If you’ve ever wished for a more functional kitchen, try reorganizing before investing in a remodel! Alex is both a talented chef and professional organizer who can help identify what you need, what you have and how you can make it all work better. You will fall in love with cooking in your kitchen! Alex Goedrich Note: This is not a cooking class. Tuesday, February 14 6-8 pm, $65, $55 Our menu will be an explosion of colors, tastes and textures on the plate. A complimentary glass of sparkling wine is included, a pairing flight is available for an additional charge. Note: This is not a cooking class. Join us on the farm and learn to use the ancient art of fermentation to preserve fresh produce. BASICS Learn how to choose the freshest seafood and masterfully prepare it using a variety of techniques. COOKING CLASSES We are proud to offer cooking classes designed especially for students ages 4 -16. Classes are hands on and all students will have the experience of making each recipe on the menu. They will use high quality ingredients, learning essential cooking skills and techniques along the way. Students will enjoy the food they have made together at the end of class. Cooking is a skill that can be developed over a lifetime. Young people get a head start in our fun, hands-on classes. Pizza is even more fun when you make it yourself! We will work together to make our own dough from scratch and then shape and build pizzas. Everyone will create a personal pizza with different sauces and toppings. We’ll make: buckwheat crepes ﬁlled with broccoli, ham and béchamel with roasted vegetables on the side; chocolate crepes with caramelized bananas, and sweet lemony crepes and berries. At the end of class, we'll enjoy our crepes together. Ages 10-16 $45, $35* for each class. Wednesday, March 15 3:30-5 pm • $15, $10* The whole family can work together to make a handmade pasta dinner. Children should be at least six years old to participate. PASTA WORKSHOP Learn to make fresh pasta the old-fashioned way! We will work together to make fresh handmade rainbow bowtie pasta; creamy alfredo sauce, and sautéed veggies. At the end of class we will enjoy what we made together, and gelato and sorbetto will be served for dessert. Celebrate spring at Soil Born Farms American River Ranch Gardens are magical places! We’ll explore the plants and ﬂowers, meet the farm animals and create something special to take home. The Dr. & the Chef: Heart Health Wednesday, February 1 6-8:30 pm • $49, $40* See p. 4 for details. Join us in the Cooking School for samples, recipes, tips on healthy living and mini fitness classes. 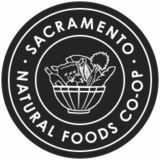 Look for our spring schedule of classes at sacfood.coop in late March. COOKING WELLNESS GARDENING & MORE! Growing Medicinal and Culinary Herbs Wednesday, March 22 5:30-8:30 pm • $25 Herbs in the home garden can add flavor to your meals, home remedies to your medicine cabinet, and beauty, diversity and beneficial insect habitat to your landscape. This handson class offers instructions for growing an array of herbs, and tips for harvesting and using what you grow. Daylin Wade All classes will be held at Soil Born Farms American River Ranch 2140 Chase Drive in Rancho Cordova. For a complete schedule of classes, activities, events and volunteer opportunities happening at Soil Born Farms visit soilborn.org. Beginning Home Gardener Course Tuesdays, 5:30-8 pm March 14, 21, 28, April 4, 11 Course Fee: $195/$175 before February 27. Space is limited. Register at soilborn.org. Learn the essential topics to help the new gardener create and maintain a thriving, abundant edible organic garden. Spring Gardening Clinic & Native Plant Sale Saturday, March 25 9 am-3 pm Learn how to grow vibrant, tasty, and healthy plants from Soil Born Farm’s knowledgeable staff and community educators. Registration will occur at the event ONLY and be on a firstcome, first-served basis. Soil Born Farms is a 501(c)3 and proceeds benefit the education program.